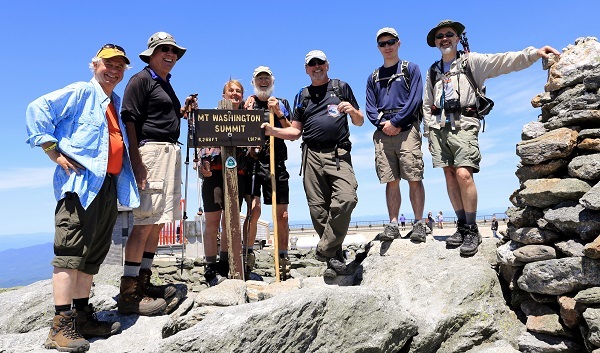 Ed “OldMan” Smith’s Grid finish on Mt Washington 06/14/15 joined by other Grid finishers (left to right) Jeb Bradley, Hiker Ed Hawkins, Nancy and Charlie Foote, Ed Smith, Jeremy Clark, Gary Tomkins. Other Grid finishers on the summit to celebrate Ed’s finish were Guy Jubinville, John Gutowski and June Rogier. Hiked all NH 4K peaks in every month of the year, The Grid - 576 peaks, on Mt Washington on 06/14/15!